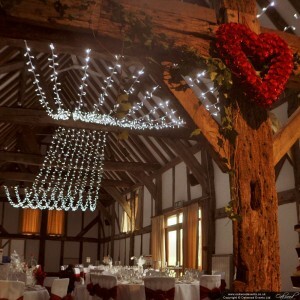 Fairy lights come in all the colours of the rainbow, but by far the most popular are warm white and cool white. Warm white gives a candlelight glow. It casts a flattering glow, works with most colour schemes and styles and usually complements existing venue lights. The look is warm, romantic and elegant. Cool white is sometimes called ice white. It gives a true white light and is perfect for dramatic schemes, icy / winter wonderland styles or for complementing blues and purples. The look is crisp, chic and sparkling. Hope you are well. 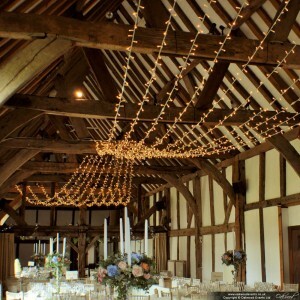 We have just got back from our honeymoon and we just wanted to say a massive thank you for the beautiful fairy lights you put up at Ufton for our wedding day. We have had endless comments about how beautiful they looked and I think it really set off the whole venue. I have already recommended you to a friend getting married at Ufton and will continue to recommend you to every wedding couple.